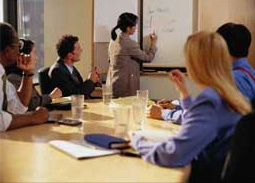 In-person trainings can be conducted on-site at company headquarters, training facilities or offsite locations. Trainings can be conducted anywhere from a day to a few hours depending on the needs of the organization. Trainings can also be customized to fit the needs of the participants. View descriptions of all the in-person trainings available in the left column. at the bottom of this page.